This is a happy story with a temporarily unhappy ending. Now, let's go back to the begining. Two Saturdays ago, Eli's soccer team played in a game that would determine who would win the league. This was the team that they'd lost to 3-2, when Eli had given the team a talk at halftime (I wrote about that a few weeks ago). Eli was all amped up to play, and he did. He touched the ball more than any other player on the field, dominated with his passing, almost scored several times, and wound up with an assist in a 2-0 win. There are usually dramatic moments, even in a game with kids this age, but this game was surprisingly drama-free. Eli's team dominated the entire game, never let the other team get the momentum, and won in very workmanlike fashion. Well, there was one moment. Late in the second half, the best player on the other team (who turned 13 during the season) was chasing toward a loose ball with Eli, both running at full speed, and Eli got there a split-second sooner. The other kid started to kick the ball away from him, but Eli put his foot on top of the ball and pulled it back. It's the single coolest thing I've ever seen Eli do on a soccer field, because it required such precise timing to pull it off. The next day, on Sunday, Eli 9.9 had an hour-long hockey scrimmage. He's been playing very well in practice, and I was hoping he'd have a strong game. I'm always trying to get him to play a little higher (at the top of the crease or slightly above), which cuts off a shooter's angle more effectively, but he's never quite been able to be that aggressive. This time, though, he was. And he was unbelievable. He made 25+ saves, played at the top of the crease or above, and looked like he owned the rink. The goalie he was playing against had been much better than Eli was six months ago, but Eli has improved so much that he's now clearly better, and he proved it over and over again, making tremendous saves. His team was ahead 4-0 with 3:00 left, and after stopping five breakaways in the game, he finally gave up a goal on the sixth, but even then, he had been above the crease when the shot was taken, and the shooter had squeezed it into about a four-inch opening over his shoulder. It was, by far, the best game he's ever had in goal, and his team won 4-1. Then they had a two-round shootout for every player, and he stopped 28 out of 30 shots there as well. In the dressing room after the game, I was helping him take his gear off. "Hey, you know how I always tell you how well you played, then mention one or two things that you could improve?" I asked. "Well, I've got nothing to say today except 'great game'," I said. "That was amazing. How did you feel while you out there?" "I felt really, really confident," he said. "Even on the breakaways." Now, after that moment of triumph for him (and he had a big, big smile when he came off the ice), he was off to soccer practice, which started in 30 minutes. He dominated that, too, scoring a hat trick in the scrimmage. After practice ended, though, he stayed to play goalie for a few minutes. One of his teammate's older brothers started playing as well, taking shots, and when Eli tried to stop a high shot, the ball was coming in so hard that it bent his right thumb way back. Plus, and this was even worse, because he was jumping upwards as the ball hit his hand, his momentum caused that same thumb to jam into the crossbar. On Monday morning, when he tried to write with a pencil and couldn't, Gloria took him to his primary care doctor, then to an orthopedist. She said he had strained ligaments in his thumb, and probably some slight damage to the nerves in that area, because his thumb was numb in places. To be safe, and to give everything time to heal, she recommended casting it for two weeks. Eli cried a little when he found out he'd need a cast--he'd miss two weeks of hockey, and the final game of the soccer season. Gloria handed him the phone after she had told me what the doctor had said. "I'm sorry, little man," I said. "Me, too," he said, his voice shaky. "Listen," I said. "When I find out something that's going to be bad, like when I found out I needed knee surgery, I feel sorry for myself for the rest of the day. The next morning, though, I think about what I can work on to get better while I'm out. So how about we try that?" "That sounds good," he said. Later, when they came home, I thought he would be all mopey and upset--which would have been okay--but he wasn't. 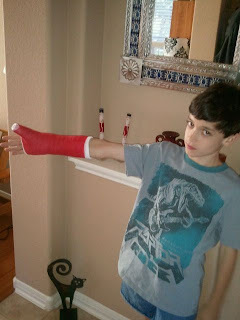 He was excited about having a cast that his friends could sign, and he was also excited that his thumb stopped hurting after they put the cast on. So he was just hanging out on the couch, watching t.v. and enjoying himself. "Mom, thanks for helping me so much today," he said, as Gloria brought him a drink with his dinner. At school the next day, he got an unlimited amount of attention, and two kids volunteered to be his "writers" when he needed help. He could even write a bit with his left hand, if he went very slowly. And, since it's almost the end of school, he hardly had any homework. All in all, it was about the best time ever to hurt your right thumb, if it had to happen. I picked him up after that first day back at school, and we talked as I drove us to Einstein's for a cookie. "I think this is a good opportunity," I said. "Well, you're an athlete," I said, "and someday, you're going to get hurt more seriously than this. It happens to everyone at some point. So we can use this two weeks as a mini-trial for what you'll do if you ever have a serious injury." "So what could we do during the two weeks to help you get better?" "I could stretch," he said. "A goalie always needs to be flexible." "That's a good one," I said. "And we can do a tennis ball toss, or you can toss it against the wall and do it faster and faster. That's a good one -handed drill. Oh, and we could watch the Pro Hybrid DVDs. I know you usually get bored after a few minutes, but if there was any time to learn more about technique, it would be now." "That's good," he said. "Three things. So I can really get better while I'm hurt?" "You can always get better," I said. "Improve something while you're out, and when you come back and get the rest of your game in shape, you'll be better than you were before." We've found out in the last five days that left-handed air hockey is just as much fun as right-handed, and that two people can play pinball together and have a great time. We're playing NHL together, too (he controls the left side of the controller, I control the right), which is suprisingly hard. It requires so much more cooperation than playing regular co-op, but we're getting better every day, even though we haven't won yet. We both know, though, that before he gets his cast off, we will.